We had beautiful weather for the Hartwell Dam Run this year - clear sky and cool temps. I finished the 10k in an hour. My time would have been much faster if I hadn't had to wait on the film crew for the feature length film above. 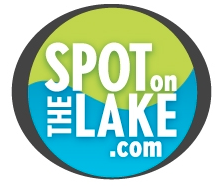 There were 15 friends of SpotOnTheLake that participated. and $1200 was raised for Relay for Life. We hope to see you there next year!